6, 8, 10 or 12.
exposed to flame .. stays that way for up to 50 washings. knit neck, cuffs and ankles. Elastic boxer waist, fly front. Shipping weight 14 ounces. . . . .
Cotton flannel Pajama Sets with masks ..
or 12. Order usual size. Tiger. 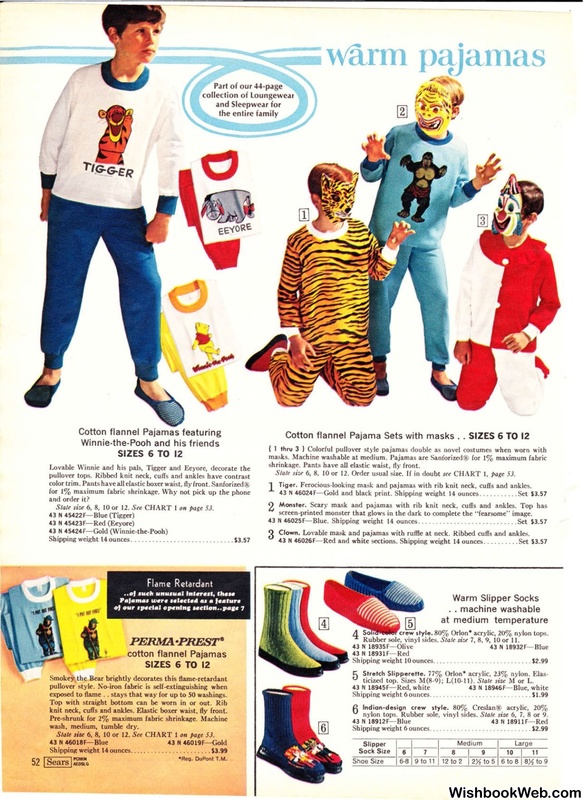 Ferocious-looking mask and pajamas with rib knit neck, cuffs and ankles. 46024F- Gold and black print. Shipping weight 14 ounces. glows in the dark to complete the "fearsome" image. 46025F- Blue. Shipping weight 14 ounces . . . . . . . . . . .
Clown. Lo\•able mask and pajamas with ruffie at neck. Ribbed cu ffs and ankles. crew style. 80% Orlon• acrylic, 20% nylon tops. 8, 9, 10 or 11.
ticized top. Sizes M(8-9) ; L(I0-11). nylon tops. Rubber sole, vinyl sides.